The curtains in the lounge are electrically operated using a SilentGliss AutoGlide electric curtain track. The system comprises an AutoGlide curtain track which replaces the normal curtain rail. Inside the track, an electrically operated drive belt moves the "eyes" to open and close the curtains. The picture shows the curtain track attached to the motor drive unit which may be fitted to the left or right side of the curtains. 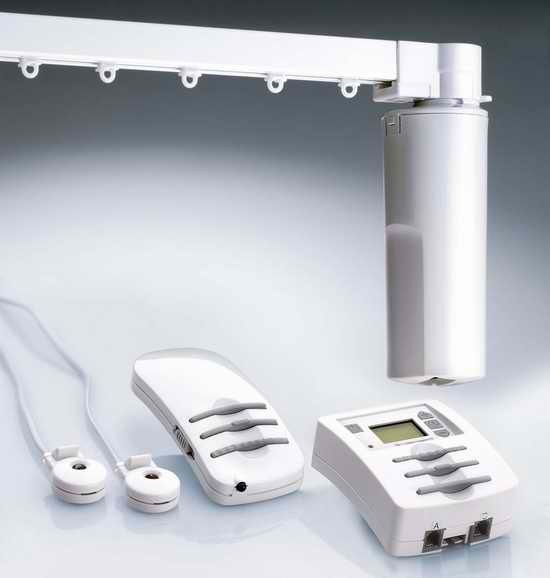 The devices below the track are the various options to control the unit; daylight sensor, IR sensor, IR remote control and the timer control unit. Depending on the level of control required, one or more of these options can be chosen as described below. The curtain drive belt is shown more clearly in this diagram. The following details are from the SilentGliss website. Entry level model which allows the curtains to be opened and closed using a fixed wall switch. Ease of use is improved with the addition of an infrared remote control. With the Timer Light unit, the opening and closing can be controlled using the wall switch, a timer or the light sensors or a combination of all three. Total control means you can combine the TL and IR options above giving you a totally flexible system. Although I chose to go with option 3, although the light sensor is installed, I don't use it to control the curtains, they mostly on timer control with the IR remote used to override the timer when required.